If you’re a Christian, you’re familiar with the Love chapter: 1 Corinthians 13. We know how its defining words cement together a beautiful picture of love. Love as God sees it and as Jesus lived it. Our challenge is to learn how it applies to us personally. We all need to love, and when love doesn’t come naturally – and that happens often – we quickly become aware that God will not rest until we learn to love the way Christ loved. Jonathan Edwards has an entire book on this chapter of Scripture. It’s worth reading. Slowly. The quotations you see in this post come from the second chapter of Charity And Its Fruits. You will be blessed by this book! Verse two challenges me because, out of all the spiritual gifts presented in Scripture, the gift of prophesy most summarizes my personality. No, I’m not claiming to be a prophet in the Old Testament sense of the word! And yet, prophesy does incur a sense of vision, of seeing beyond the moment and being able to capture a sense of what may be coming in the future. It’s an ability, or a way of thinking, that circumspectly looks ahead as a normal manner of thought. I’m a visionary. Just as a person endowed with the gift of teaching generally thinks in patterns of explaining or sharing how to do something, a visionary seeks to share truth or a “big picture” view of a situation. Although we don’t live with the Old Testament reality of prophets and miracles, this verse still speaks to us. Each of us can relate to the spiritual gifts given to the faithful men of old (see 1 Cor. 12), simply by looking at our own ‘gift’, talent, or personality. I am in no way intimating that we have the ability to “see into the deep things of God by immediate inspiration” like the prophets Jonathan Edwards was speaking of. Their prophetic ability was endowed by God alone and was extraordinary! Our strengths and personalities are gifts from God, and yet it is easy to begin to trust in those gifts rather than the Gift Giver. We can begin to ‘prophesy’ (share truth) from our own strength rather than from a position of humble servanthood; from a place of service to the King. We often forget that we are to serve God and look to Jesus as our ultimate example. Jesus taught us to love first. Jonathan Edwards speaks of these supernatural gifts of God such as healing, prophecy, and miracles: “the extraordinary gifts of the Spirit of God are indeed great privileges” and “tokens of God’s extraordinary favor and love.” Could it be safely assumed that any gift or personality that God bestows upon His people is to be viewed in the same light? A special gift, given to each of us, to be used in love , with responsibility and a view of blessing others with it. If you have a visionary personality, one that sees well in front of where you are going, it can be a huge blessing. It’s a good thing to take precautions when we see future problems in our life or the lives of those around us. Especially when we see others in sin. Yet, lacking kindness, generosity, or compassion in the delivery of that message will only result in deaf ears. We become “nothing” – like the verse states. Others can’t hear us. Our words just beat against the sound of their own need for love. We become like a noise machine that helps someone sleep through the chaos going on inside them. The drone of our warnings actually does the opposite of inciting change. Yet, he continues, “true grace is that whereby the very soul itself becomes as it were a precious jewel.” God’s grace resulting in the very act of love is more precious in the soul of a believer than any special gift or talent or personality we can possess! So it is not the extraordinary gift within that implies a holy nature, a mature man; it is the Spirit within that imparts new life! So what does 1 Corinthians 13:2 teach us about sharing truth, knowledge, or faith? About exciting change in this fallen world? That it is Love with a capital ‘L’ that rules! Love reaches the depth of the human soul. Make love the foundation of all the truth you may share. Keep love at the core of our motivation to expose lies. What do we do if we’ve already hurt with our ‘words of wisdom’? Be examples of Christ to others. Love them as you love and care for yourself. Charity And Its Fruits, is a written record of sermons Jonathan Edwards preached in 1738. It is an entire book on the Love chapter. It’s worth reading. Slowly. You will be blessed! Let’s serve the Master by learning to Love! Now in the sixth month, the angel Gabriel was sent from God to a city in Galilee, called Nazareth, to a virgin engaged to a man whose name was Joseph, of the descendants of David; and the virgin’s name was Mary. I would love to have been Mary! To be chosen – favored – by the Lord to be the mother of The Savior. To know exactly what I am supposed to do. To have a purpose that transcends all the little things in life. To be the mother of my Lord! What must it have been like to be so humble as to have said, “Be it done to me according to your word” and “My soul magnifies the Lord.” Oh to be so pliable and willing! But during a conversation with my daughter, she woke me from my imaginings to remind me of the pain and suffering Mary went through. We only think of the bumpy ride on the donkey or that uncomfortable delivery in the stable. But there is so much more she committed to when she stated those words! What did being “favored” really entail? By definition, “favor” includes being: approved, preferred, protected, and given consideration. 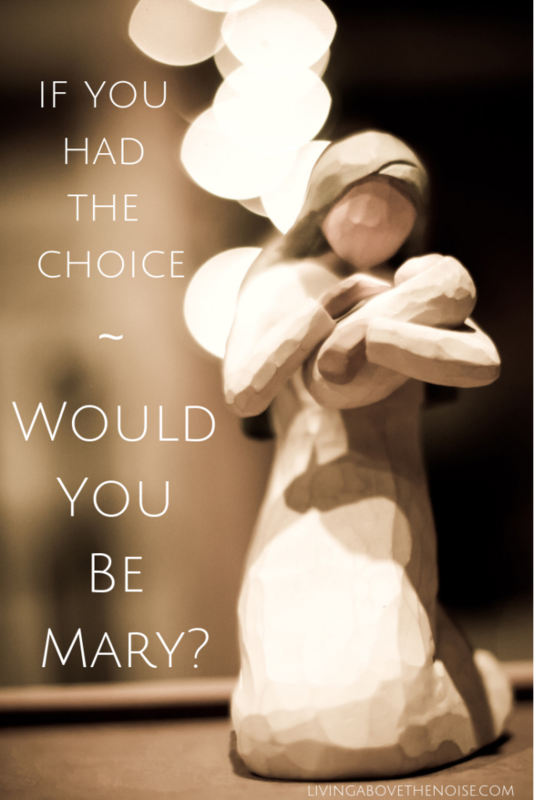 Mary was chosen for a specific purpose, defined to do a certain work by the God of the Universe! But that didn’t mean the work would be easy or risk-free! I had the wrong picture when I thought of Mary and her role, as if it would be somehow easy and filled with honor and respect. What Did Mary’s “Favor” Require of Her? Mary had knowledge from the beginning of motherhood that her son would be a ruler and a king. She must have waited and wondered what time this would occur. Was she on pins and needles, wondering? Knowing the prophesies, did she treasure each moment given to her with her Son? How did she respond to this favor? Remember, Mary’s pregnancy was no piece of cake either! She became pregnant out of wedlock. Then, she had to tell her betrothed of her plight and risk her future husband’s trust. She was discredited by her neighbors, enduring their mocking and disdaining looks. Not pleasant, I’m sure? Would I really wish to be Mary now? Added to that, her delivery was a bit unusual. She was taken from the comfort of her home and family and sent to a distant town to deliver her baby. Imagine being nine months pregnant, ready to deliver, riding on a donkey all the way to Bethlehem. Plus, Mary most probably labored on that donkey! Oh, my. How’s my dream looking now?! Of course, she did have the wonderment of shepherds finding the new family in the cave and praising God for their deliverer being born! What an incredible confirmation of God’s plan. But wait, there’s more! When they were settled in their home raising their Son, the call came to take Jesus to safety in Egypt to escape the crazed ruler who threatened to kill her child! Another move to make, trusting God to work out all the details. Trusting Him to save this Son and probably hoping that this would not be the time of His sacrifice. What trust must Mary have had to endure this time of uncertainty! What patience. Now fast forward to a time much later. A time of peace and contentment, knowing her son was a capable carpenter running a business with his earthly father. When would Jesus’ time come to do business with His heavenly Father? I imagine she wondered that often. And then, Jesus began to move forward in God’s plan for redemption, becoming the Master Teacher and Healer! What joy, what honor, what favor must Mary have felt as she watched her Son begin to teach and heal and forgive. What trust in God to do exactly what He foretold so many years ago! Now the time has come. And so she waits. What is the culmination of Mary’s “favor”? Having to watch as the whole world turns upside down around her — all because of her Son — God’s Son! What must it have been like to listen to the words of the Pharisees, the community, the leaders – all speaking words of hatred about the Son of God, her Son?! Yes, this must be what God meant by sacrifice and savior. Oh, that I would remember Mary, a mother like I am, standing by as the people mocked, spit upon, and voted against her Son. Being no more than a bystander, she watched as her Jesus was beaten, scourged, pierced through, and finally, crucified – hung to die on a cross, for all to see! Oh the agony, the pain, the sadness she must have felt! May we never forget Mary, the one kneeling next to the manger in our nativity set, looking so content, suffered and served as the one who was ‘favored’ by our God. Favored to do His will. Favored to bear and raise up the only Son of God. Favored to see through His plan for salvation. Favored to witness the death of her Son. Favor. Do I really understand what this word truly means? Am I ready to do God’s will in whatever manner He decides to favor me? Or am I waiting for my own idea of favor to come upon me before I will truly ‘magnify the Lord’? Oh, this is such a huge message for me this season! Mary found favor, trusted in her God, and acted in faith and obedience through all her great trials. She lived her life — poured out her life — to see God’s plan unfold. I now know why God chose Mary. If you’re anything like me, with politics ranking somewhere behind going to the dentist, you might be surprised to find that supporting our government or our politicians doesn’t always mean that we become versed in the bureaucratic lingo of the day, nor that we even know what bills are up on the docket. We can actually do a great job from our own place of duty – the home. Our family’s political ‘history’ has been in the avenue of Civil War reenacting for 12 years. My daughter’s love for history began our research into state’s rights, the slavery issue, and our country’s political issues during those turbulent times. Because of our hobby, we have learned much about politics and government, and also many details of a woman’s role during that era. This knowledge gives us strength in our own era, to stand strong in our feminine roles in this age of “liberation”. The typical view of the day during the mid-1800s was that women were frail and lacked the intelligence to handle the political issues of the day. Women were to be protected as “the weaker vessel”, following the Biblical instruction, and that included politics. Now before you get your shackles up, realize that I am not saying that I agree with the unintelligent and frail part! But in my home, the ‘weaker vessel’ part is often true! There are times when my ‘momma’ instincts and protective nature has made me incapable of handling some news concerning the welfare or freedom of Christians, or of homeschooling families, or of the unborn. Having my husband take in the information or take on the battle, gives me time to settle down to do my job as wife and mother without the stress of worrying about the future. I can feel secure knowing that my husband is carrying that weight – and this can be a great relief to my already taxed brain! Yet, it in no way means that I cannot understand the issues at hand, nor offer sound ideas and opinions, simply that Scripture offers us that protection from having to take it on singlehandedly. I thank God for my man’s big shoulders! History reveals a very different view of women in politics than our current culture. Women in history were less outwardly political, yet more influential behind the scenes in the course of government and political decisions in history, more often ably supporting their husbands from the home front. Drink deeply of these words penned from a man strengthened by his wife. One can only imagine the life-giving strength that his supportive and doting wife gave him as he strained in the daily life of war for over two years, from April, 1861 to his death on May 10, 1863. Aug. or Sept., 1861 – near Manassas – Yesterday I received two letters from one little jewel of mine at Cottage Home, and I am just going to read them over and over again and answer. First, in reference to coming to see your esposo, what would you do for privacy in camp? I tell you there are more inconveniences attending camp life for a lady than little pet is aware of; and worst of all is the danger you might encounter in such a trip, as the cars are so crowded with soldiers …..Little one can come on with the first good opportunity, if she is willing to bear the unexpected occurrences of war. In Stonewall’s letters to his “Esposita” we read of Anna’s faithful influence on this famous general. A man is greatly affected and changed by the woman who stands behind him, and Stonewall wrote thousands of words describing his security in his wife’s love and support. Oct. 20, 1862 – Don’t’ send any more socks, as the kind ladies have given me more than I could probably wear out in two years. God, through kind friends, is showering blessings upon me….…Let the soldiers have all your blankets.……Don’t trouble yourself about representations that are made of your husband. These things are earthly and transitory. There are real and glorious blessings, I trust, in reserve for us beyond this life.……I appreciate the loving interest that prompted such a desire in my precious darling…. General Jackson’s confidence in the woman he left behind must have affected his ability to stay composed for the decisions required of a general. Anna’s concern and love for her husband helped to balance his perspective on life and the world around him. It calmed him during the storms. And he reciprocated by calming her concerns during his trying times in battle. The current trend in our culture is to consider that a woman who stays home to raise her family is “just a wife”. But being a wife can and should be much more than one facet. She can learn much about the world around her, be involved in her community, and manage her home well, which adds to her husband’s resources, knowledge, and confidence in which to be a leader in their community. A wife supports her husband in countless ways so he can attend to his business, enabling him to become known as an integral part of his workplace and community. He isn’t burdened by the worries that his home and family are needing his constant attention. Scripture commends the Proverbs 31 wife in verse 23 when it speaks of her husband – that “he is known in the gates”. The following quotes revealed Stonewall’s trust in his “business little woman” to hold down their home fort. A wife can offer input and advice when her man’s thoughts are overloaded and he doesn’t have the time or energy to think a new thought. When he needs fresh perspective, a back rub, or a calm home in which to make decisions. We wives actually have more power in doing these simple tasks than we imagine. I just had to add this next quote! Here is General Jackson, a devoted husband and father, giving child training tips even from the battlefront. Jan. 17, 1862 – I am gratified at hearing that you have commenced disciplining the baby. Now be careful, and don’t let her conquer you..….I am still thinking and thinking about that baby, and do want to see her. Can’t you send her to me by express! There is an express line all the way to Guiney’s. I am glad to hear that she sleeps well at night, and doesn’t disturb her mother..…..I do hope she will get over her fear of strangers. If, before strangers take her, you would give them something to please her, and thus make her have pleasant associations with them, and seeing them frequently, I trust she would lost her timidity. After Stonewall’s death, Anna made it her purpose to preserve and honor her husband’s character and legacy. So, even without an affinity for politics, like Anna Jackson, you can learn what your husband needs as you support and encourage him in his role as leader in your home, and even in your community. And the old saying rings true again – that behind every great man is a good woman. Will you be this kind of woman for your man?